I've been checking out the Careers Unificintegration and so far it seems quite nice. One problem, however, is that there is no way to remove jobs that have been previously evaluated to be a poor fit. Ideally, there would be a "Not Interested" button, or something, that would cause the job to be hidden from the index page and search results (and possibly even the sidebar advertisements). 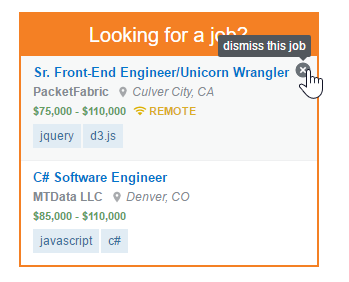 In my field, many of the jobs have very similar titles, but vastly different requirements. It would be nice to not keep stumbling upon the same unsuitable positions over and over again. Currently, that undo button is the only one available, which means that if you dismiss a job and then navigate away to another page, there's no way to see that job (as an ad) again. 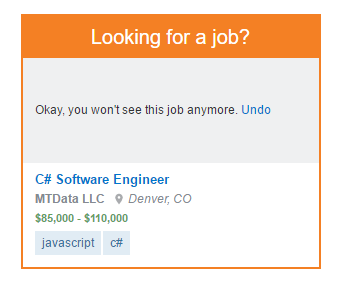 You can still visit Stack Overflow Jobs and find any job you've dismissed (the filtering is strictly on the job ads side of things). Note that this feature depends on cookies, you won't see it if you have cookies disabled. Why does SO continue to show me ads for jobs to which I've already applied?